Oh, summer. Tell me, where did you go? When we last spoke, I had just started my (super amazing) new job as Food Editor at SheKnows.com. It’s now the beginning of November and the only thing I can tell you is that the start of fall came and went way too fast. I’ve been pretty busy lately, and not getting to cook as much as I’d ideally like. There’s been dinners out, lunches out and basically a little bit too much eating. Not necessarily surprising considering my new gig, but now I am fully planning to get back on track with my eating habits. Seriously. I have a few big goals for my November: clean eating only (no eating out unless I have to for work), give up soda and coffee (which has been good so far), start going to sleep earlier, go back to regular exercise (in the morning, hence the earlier bed time) and drinking less. I won’t be fully going sober, but just a lot less. To start, I’m enjoying going back to the farmer’s market. And because I still kind of miss summer, I decided to make a salad I fell in love with this year. Inspired by my extremely new love of corn, I became obsessed with Mexican street corn (elotes). It’s basically grilled corn, slathered in mayonnaise, topped by chili powder and cojita cheese. I’m in love, guys. Seriously. The corn is just so perfect and sweet and spicy, I can’t get enough. But part of healthier eating is less calories, and less calories means no more mayonnaise. Instead, I used my favorite technique for making fresh kale and combined it with elotes-style flavors without the fat. The salad came out great, and had that perfect sweet-and-spicy combo that I love about elotes. Plus, the fresh kale adds some much-needed vitamins. 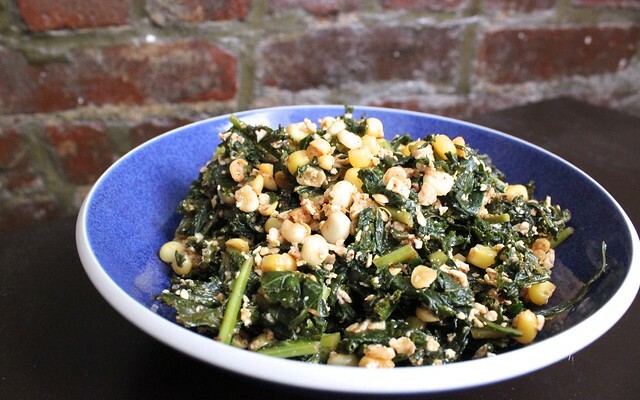 Take the flavors of your favorite Mexican street corn and turn it into this healthy kale salad. To make the best fresh kale: Wash your kale, then cut out the stems. Put 3-4 leaves together, then roll them up and slice them into ribbons. Once you have cut up all of the kale, place it in a large bowl. Pour in the juice of one of the limes on top, then add in the sea salt. Massage the kale, then let it rest in the refrigerator for 1-2 hours. Take a small pot, stand up your corn and cut the kernels off to fall directly into the pot. Pour in enough water to cover the corn and one inch more. Set the corn water to a boil, then lower it to a simmer for 2-3 minutes. Allow the corn to cool. Put the corn in a small bowl, then add in the chili powder and mix well. Finally, put together your salad. Take the kale out of the fridge and add in the spicy corn, the shredded cotija cheese, the olive oil and the juice of the second lime. Mix together, then serve. Have you ever tried to recreate your favorite indulgence into a healthy treat? Want more Healthy Latin Food? Follow me on Twitter and Instagram, become a fan on Facebook, or sign up to receive e-mail updates. And if you have any questions about cooking healthy or weight loss, please don’t hesitate to e-mail me. Thanks for reading! 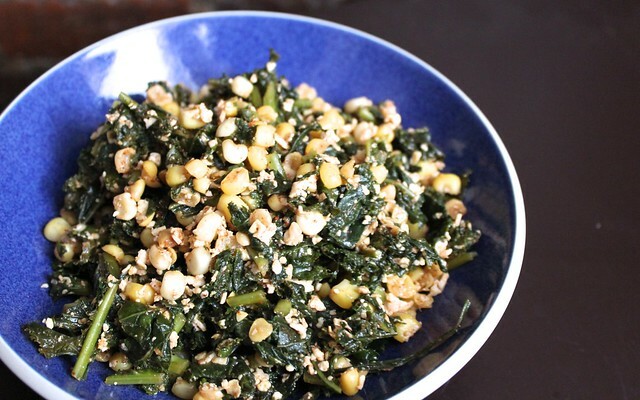 This entry was posted in Mexican, Salads, Summer, Vegetarian and tagged corn, elotes, kale, seasonal by Irina Gonzalez. Bookmark the permalink.